1.Intraguild predation in the insect communities. 2.Advances in research on phototaxis of insects and the mechanism. 3.Progress of studies on insect midgut aminopeptidase N serving as Bacillus thuringiensis insecticidal crystal protein toxin receptor. 4.The recent advances in honeybee queen pheromone. 5.Research advance on electrophoretypes of different strains of cytoplasmic polyhedrosis viruses from .Dedrolimus.. Spp. 6.Bionomics and integrated management of five species of cockroaches. 7.Advances in the studies on infesting and controlling chironomids in municipal water system. 8.Cloning and sequence analysis of cDNA fragments of cytochrome P450 fromHelicoverpa armigera. 10.Using capillary gas chromatography detect the activity of O-demethylation of cytochrome P450 in Helicoverpa armigera. 13.Swarm periods of primary reproductives in Cryptotermes domesticus. 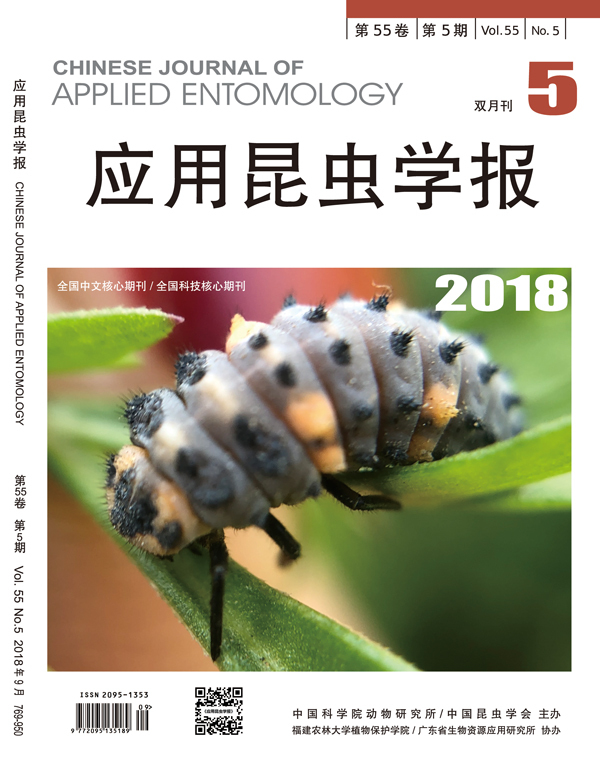 14.A preliminary investigation of damage in forest by Aporia crataegi and Nymphalis xanthomelas in Xinjiang. 15.Larval spatial distribution pattern of Xylotechus rusticus. 16.Fine structure of the alimentary canals of Mecopoda niponensi. 17.Analysis and removing methods of the defensive substance benzoquinone in Tenebrio molitor. 18.Threshold temperature and effective temperature sum of the pollen beetle Haptoncus luteolus. 19.Bionomics of Hebomoia glaucippe in Guangzhou. 20.Forecasting for occurrence degree of Cnaphalocrocis medinalis by analysis of periodicity. 21.Occurrence and control of Udaspes folus on the host plant Zingiber mioga. 22.Observations on the bionomics of the haplometrosis of Vespa bicolor. 23.The dispersal behavior of Hepialus gonggaensis larvae. 24.Equation of predator functional response and estimation of the parameters in it. 25.Techniques used in insect neurobiology research: electroantennogram recording. 26.Methodology of efficacy tests for mite-repellent chemicals in laboratory. 27.A climatic chamber for controlling CO2 concentration——CDCC-1 chamber. 28.A new and simple method for efficiently collecting eggs of the striped stemborer, Chilo suppressalis in rice.